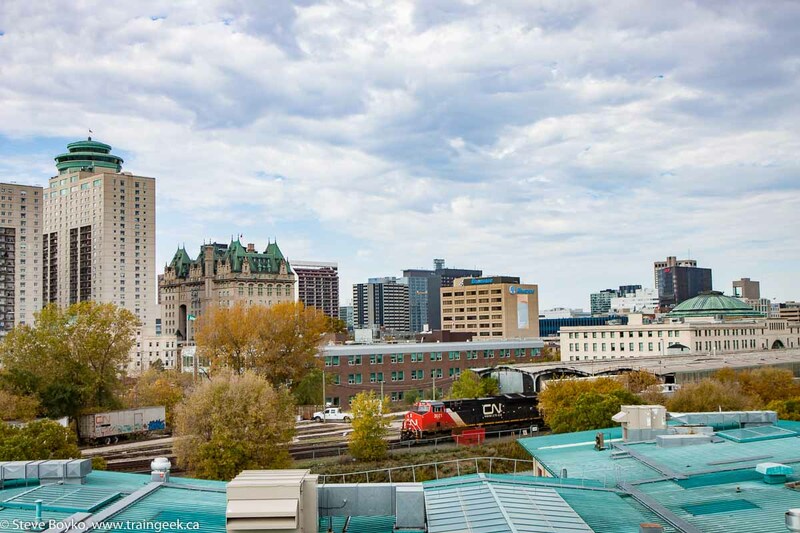 After my recent trip to Saint John, NB (see Saint John Railway Scenes and CN 406, Times Two), I hopped on a plane back to Winnipeg. Well, actually, I took two planes... a little prop plane to Montréal's Pierre Elliott Trudeau International Airport (aka "YUL") and then a jet from there to Winnipeg's James Armstrong Richardson International Airport. I had a three-hour layover in Montréal. I decided that I wasn't going to just sit around playing with my computer or phone. I knew from a past layover that the Dorval VIA / AMT train stations were within walking distance, and since I like to walk, this could be done! 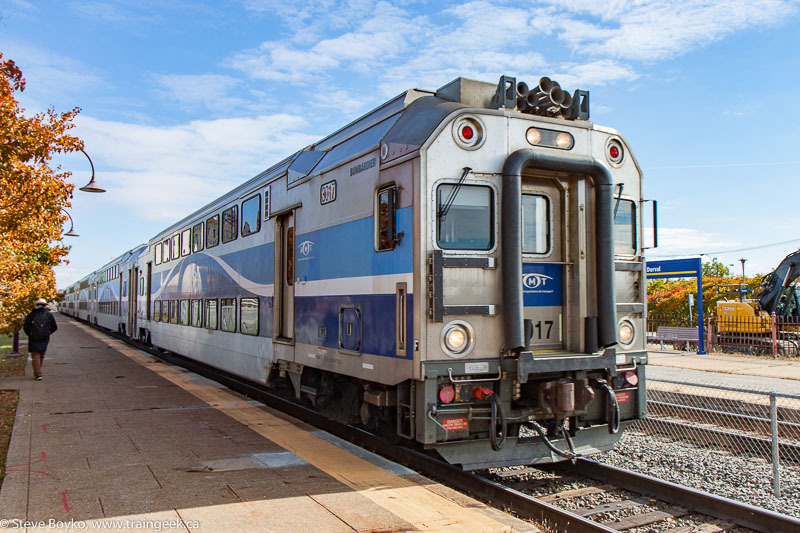 Dorval is on the CN Kingston subdivision and the CP Vaudreuil subdivision. I was fortunate that I was only a few seats back from the front of the plane, so I was able to deplane quickly and zoom out of the airport. I walked through the acres (hectares?) 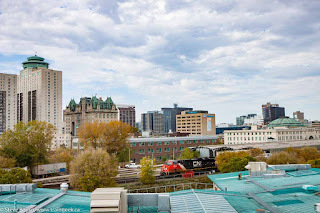 of parking garages and open air parking lots toward the Dorval train station. It is a good 15-20 minute walk at a brisk pace. I was carrying my camera bag (a Lowepro SlingShot 102 AW , if you're curious) and my laptop bag, so by the time I reached the station I was a little warm and my back was a bit sore. No worries! The AMT and VIA stations are quite close to each other but they are separate. AMT has a pair of tracks with little one story shelters beside them, and VIA has a full train station beside their own pair of tracks. There is a tunnel that goes under all four tracks so you can go to any platform without crossing tracks. I looked at the AMT schedule - displayed on the station outside - and determined that nothing was coming until 13:02, so I walked over to the VIA station. VIA 35 showed up very soon after I arrived, with VIA 6414 for power. You may remember that 6414 was the Loto Quebec unit when they were still wrapped, and was derisively labelled as "the Turd". In the photo above, you can see the second engineer looking back to spot the train at the right place on the platform. There was quite a crowd on the platform but it did not take long for everyone to get on or off the train. I elected to shoot video with my iPhone as the train departed. The consist was 6414 / 3451 / 4177 / 4118. 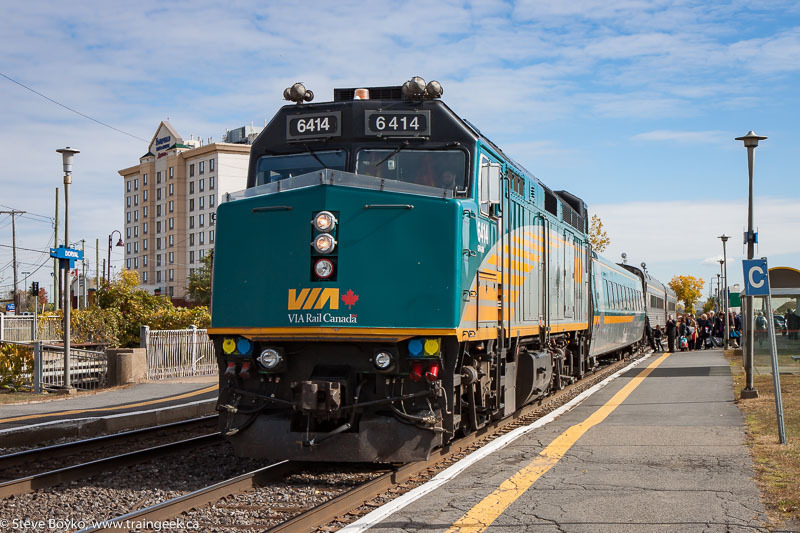 I noted that VIA 3451 had a poppy sticker on it already. After VIA 35 left, I went inside to check the schedule. Nothing for an hour. Off to AMT. I knew I would have a bit of a wait for the next AMT train, but I was hoping for a freight train to come along. 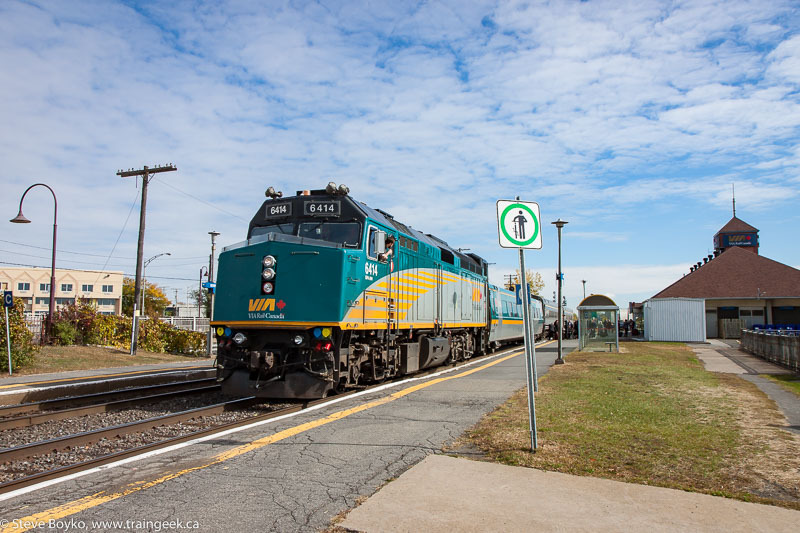 CP, CN and CSX all come through Dorval at different times, and on my last visit to Dorval I caught a CP freight. I paced around by the AMT side for a while, but nothing came along until the scheduled AMT train, led by cab car 3017. They sure have a lot of horns on these cars! I was on the wrong side of the sun but I had decided to stay here because I would have the fence in the way on the other side. Maybe wrong, maybe right, but that's the decision I made. It's important to think of these things if you have time to do so. After a very brief stop, they continued on their way and I shot AMT 1325 pushing the consist westward. AMT 1325 is an F59PHI locomotive. The next VIA train was VIA 34 at 13:18 and the next AMT train was after that. My flight to Winnipeg was at 14:40 so I thought I might be pushing it a bit to wait for VIA with a long walk to the airport after that, so I set off for the airport. In the end I was glad I didn't hang around, as the security line was pretty long and I didn't have a lot of time to wait before my flight boarded. It was the right decision. I neglected to mention earlier in this series that I took a few photos of NB Southern switching in Saint John that week. GMTX 2639 and NBSR 911 were switching the west end of the Dever Road yard (aka "Ponderosa yard"). I took a few minutes to watch them do their thing. There is no really good angle to photograph units here without this upward look to them. When I last saw #911 in December 2014, it was still HLCX 911. Since then, NB Southern purchased the unit and patched it to be NBSR 911. It still has the crossed out "Union Pacific" on the side, but I'm sure it will be repainted into green and yellow like the rest of the fleet eventually. For now, enjoy the patch job. 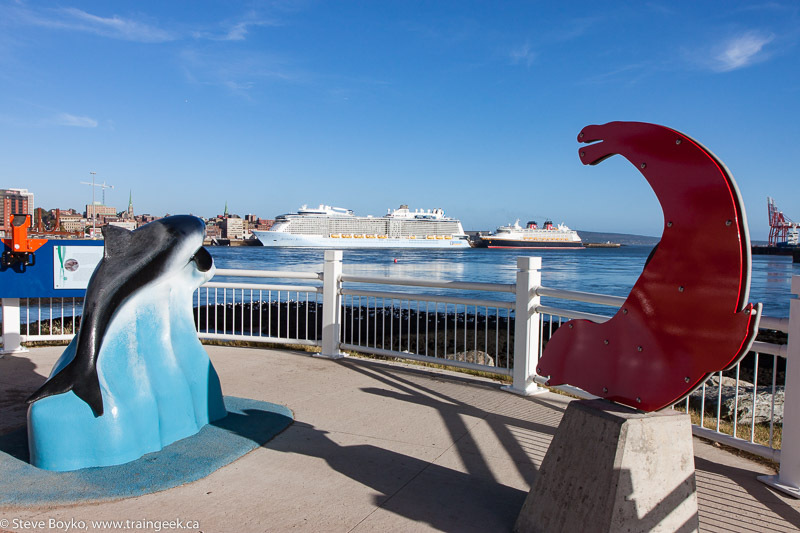 Totally not train related, but I also spotted a couple of cruise ships in the Saint John harbour. The big one was "Anthem of the Seas", a new Royal Caribbean International behemoth delivered in April 2015. 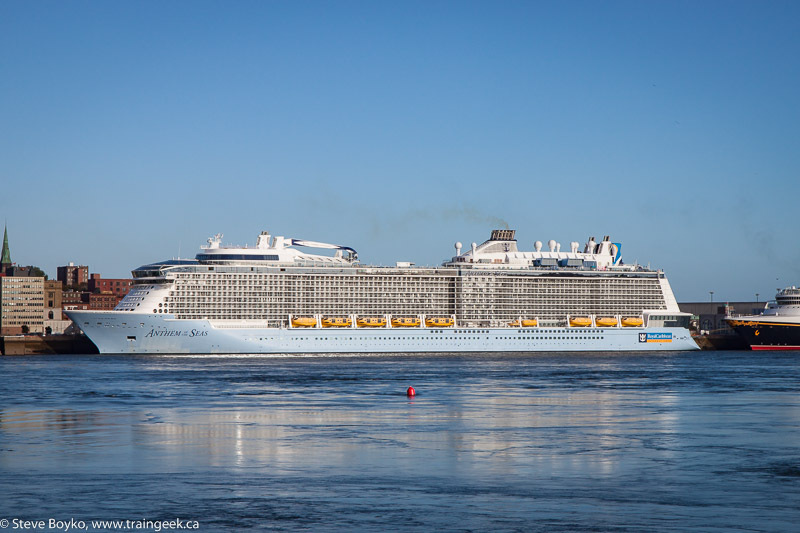 This monster is just over 1/3 km long with a capacity of 4,180 - 4,905 passengers. It has a crane on board to lift a "NorthStar" observation capsule up to 300' above sea level, and an indoor skydiving simulator, as well as many other amenities. The smaller vessel was the Disney Magic. 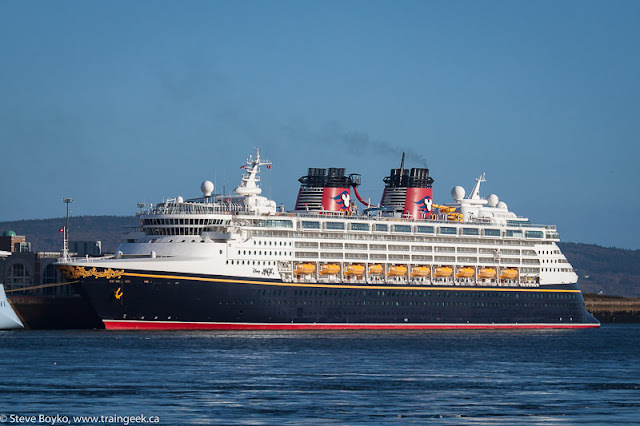 This vessel was launched in April 1997 and can carry up to 2,700 people even though it is not much shorter than the Anthem. The Magic is definitely not as tall! 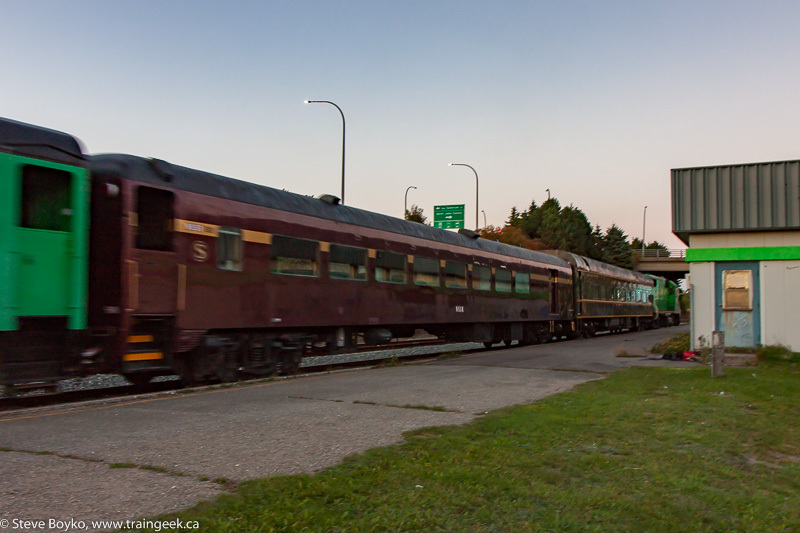 Maybe the excursion train I saw on October 11 had been carrying cruise ship passengers? Disclosure: This post contains one or more affiliate links to Amazon. If you purchase any item from Amazon via that link, I receive a small commission from Amazon at no additional cost to you. Just so you know. 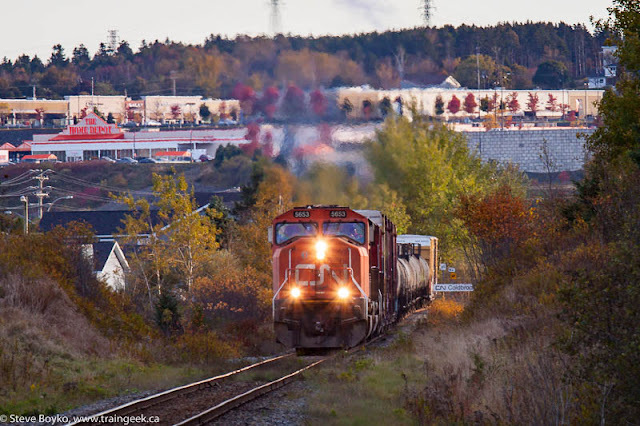 After missing CN 406 (see previous post "Saint John Railway Scenes") I tried again on the next two days with some success! 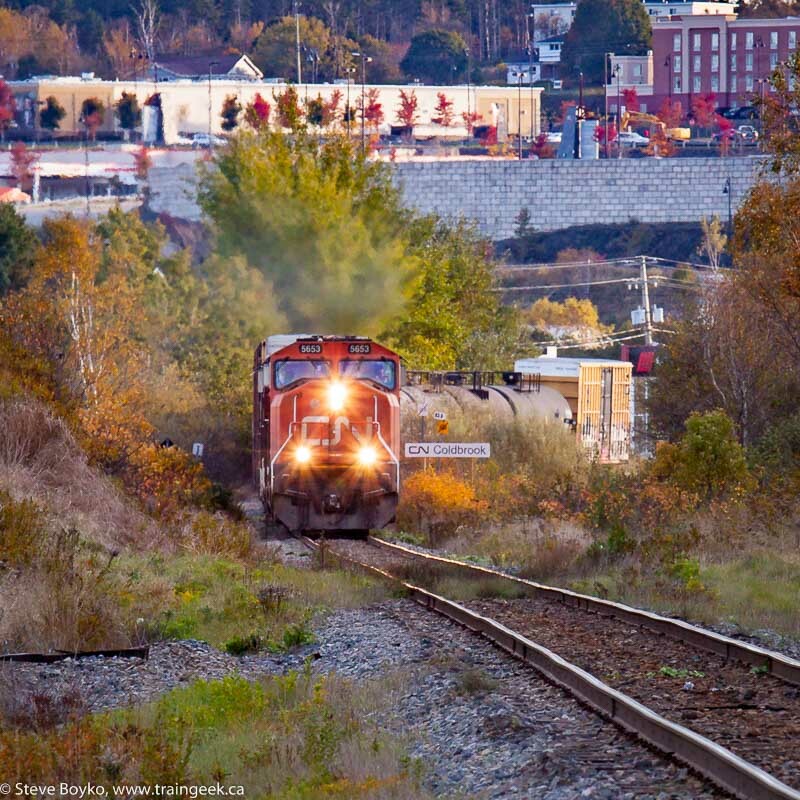 These days CN 406 leaves Moncton in the early afternoon, arriving in Saint John late in the afternoon. They usually have a quick turnaround, dropping their cars and picking up the cars to go back to Moncton and onward. Since NB Southern does all the local switching in Saint John (except for the potash terminal), they don't have much to do and can get out of town quickly. I popped my 70-200mm lens on my camera and started shooting. I stepped across the tracks to try the other angle. Keep in mind they were half a kilometre away and not moving quickly. I hopped in my car and hit the road. I wasn't sure where I could catch them, so I fell back onto my own knowledge and headed for Hampton. I like Hampton because it's not far from the highway, and it has a nice station there. 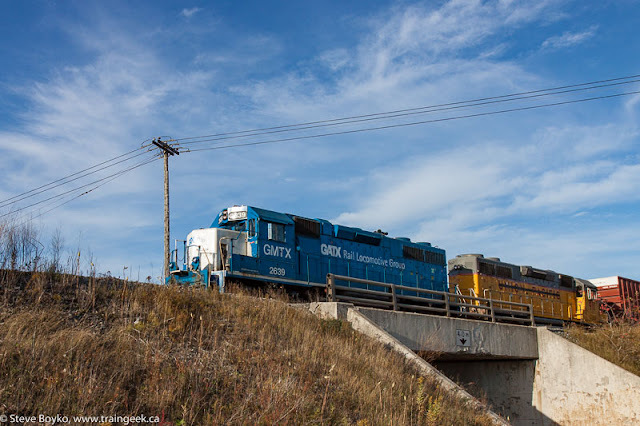 I photographed it back in September 2011 after chasing CN 406 in the area. I walked around a bit, looking for any angle that might feature a bit of fall foliage and yet have some light. 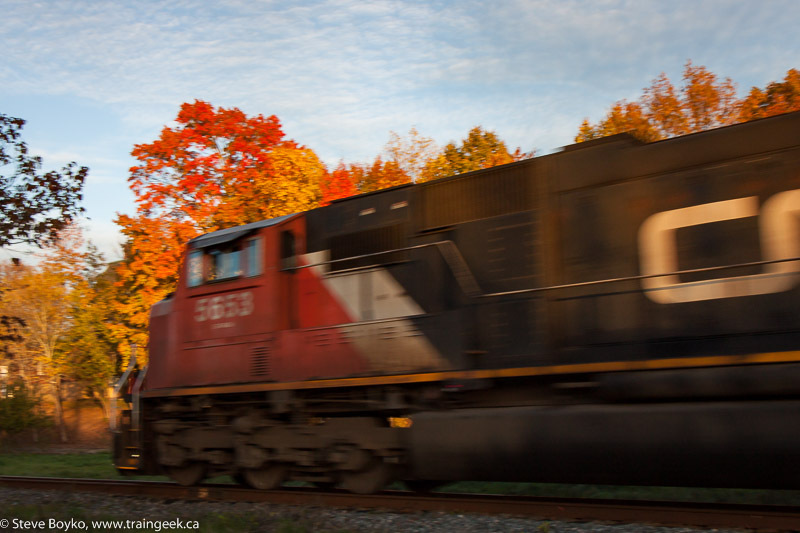 With an eastbound freight at sunset, you don't have many options. The fall foliage was really nice, though. Eventually I decided to shoot at the main crossing in town, to grab a "coming" shot by the station and then get the lead locomotive just past the crossing with fall foliage behind it. As the train approached, one car stopped at the crossing as the lights started... then darted across as the gates started to come down. ANYway, here's the "coming" shot with CN 5653 passing the station. 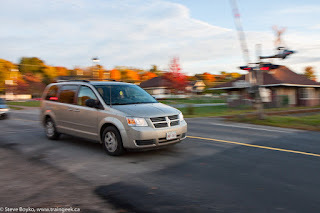 I was shooting with a low shutter speed (1/40s) because of the low light at 6:30 PM. Unfortunately, I messed up the "going away" shot. Nothing's in focus. It was a short train and I shot the tail end too. This turned out better. So that was CN 406. 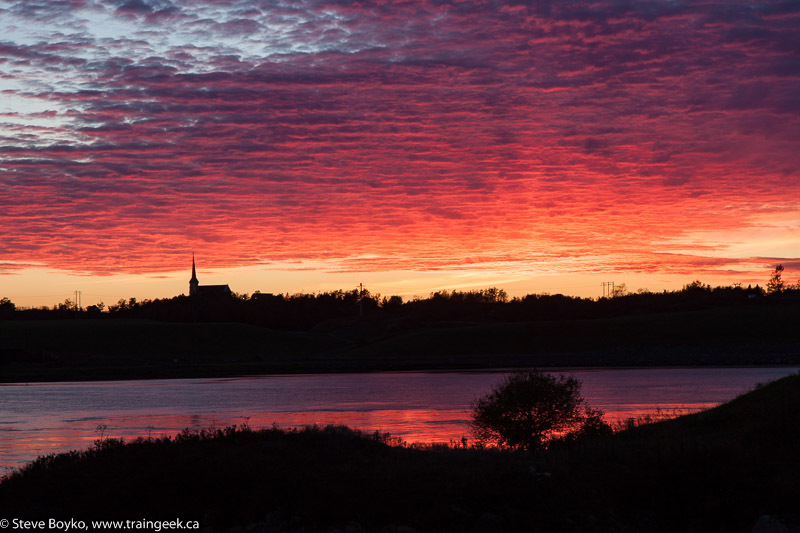 As I returned to Saint John, the coming sunset was pretty special, so I searched for a spot to try to capture it. I ended up just upriver of the Reversing Falls bridge to capture this scene. In the afternoon of the 13th I learned that CN 406 left Moncton around 1 PM and was expected in Saint John around my quitting time. I left work and headed up Rothesay Avenue, wondering if I was too late. I decided to go to the Lafarge concrete plant just beside the highway (here) and hope I wasn't too late. I had just arrived when I heard the horn of the approaching train. My camera was in the trunk and I didn't have time to get it out, so I jumped out of the car and snapped a few photos with my iPhone as the train passed. It had the same consist as the previous day (2326 - 8000 - 5653), but 2326 was leading because they were coming to Saint John this time. After the (longish) train passed, I headed back into Saint John. To my surprise, I saw that 406 had stopped for a few minutes and then got started again. Maybe they had to throw a switch? I'm not sure why they stopped. Regardless, this allowed me to get ahead of them and I took a video of the train as it entered the yard. Be warned, it's long, as the train was long and slow. 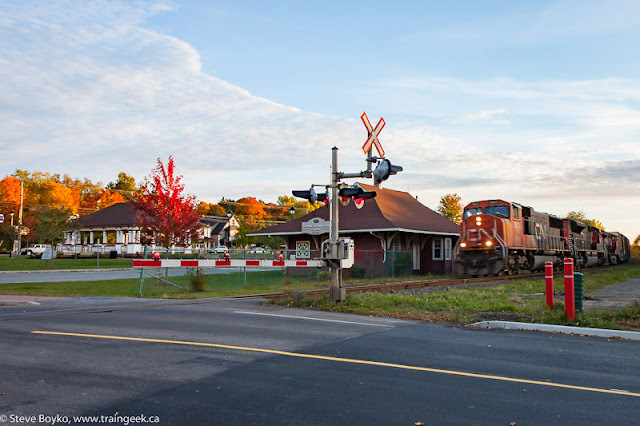 I didn't have time to stick around to see it leave, as I headed up to Oromocto to visit my mother. She had a kitten! So that was CN 406, twice. 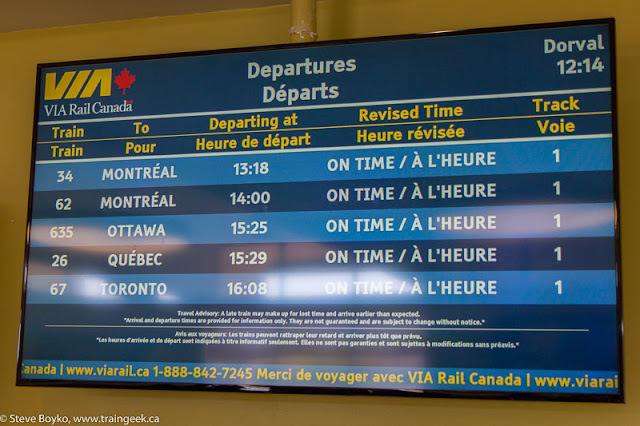 In my last post of this trip, I related how I took some time between flights to railfan the Dorval train station in Montreal on the way home. READ ON! I was in Saint John, New Brunswick last week for work. I didn't have any specific plans for seeing trains, as I wasn't sure how long I would be working each day. As it happened, things went pretty smoothly so I did see some trains. My plane landed in YSJ (Saint John airport) pretty much on time at 17:35, and fetching the rental car and luggage was quick. One big bonus of small airports is doing the renting in sight of the only baggage carousel! 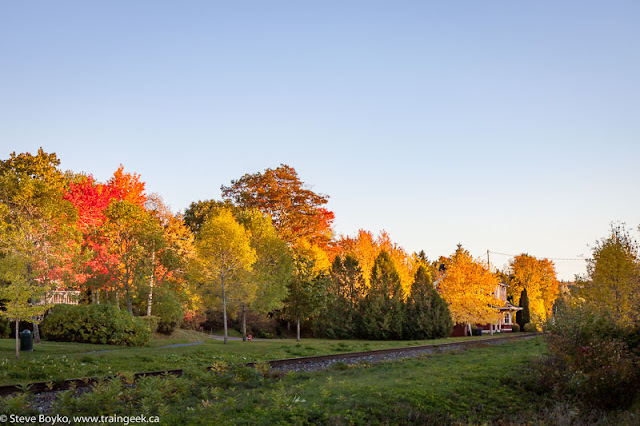 I decided I would head straight to the former train station in Rothesay to photograph it with the fall colours. I had a hope in the back of my head that I could catch CN 406 passing by (to reproduce this), but I wasn't counting on it. As I approached Station Road by the Rothesay station, I saw the last couple of tank cars on CN 406 roll by on their way to Moncton. Missed it by that much. You can't catch 'em all. There was no point in pursuing them. It would have taken a lot of time to get back to the highway and the light was failing. At least I got the shot I wanted. I headed into Saint John. As I drove along Rothesay Avenue, I spotted a set of locomotive headlights on the track leading to Courtenay Bay / Irving Oil / Irving Paper. 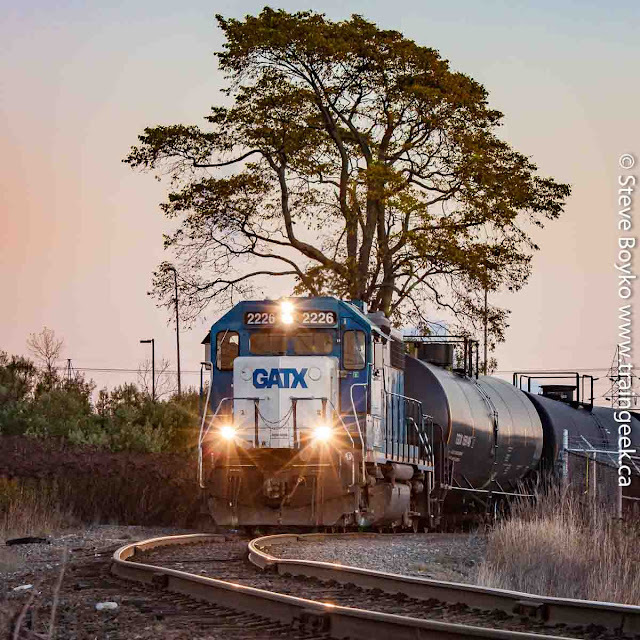 I headed up and found GMTX 2226 working the crude oil terminal at Courtenay Bay. The sunset light was pretty sweet. I thought about staying to watch them switch, but I decided against it and continued on along past Island Yard. I was going to head to the NBSR Dever Road yard and see what was going on there before turning in for the night. Imagine my surprise when I saw this excursion train at Harbour Station! I believe they had taken some people from a visiting cruise ship out for a spin. I saw a large cruise ship leaving Saint John that night. In the photo above, you can see the crewman walking back to the cab. I must have looked pretty comical running back and forth as I wasn't sure which direction they were going. As it happened, they headed toward the Dever Road yard / NB Southern yard. 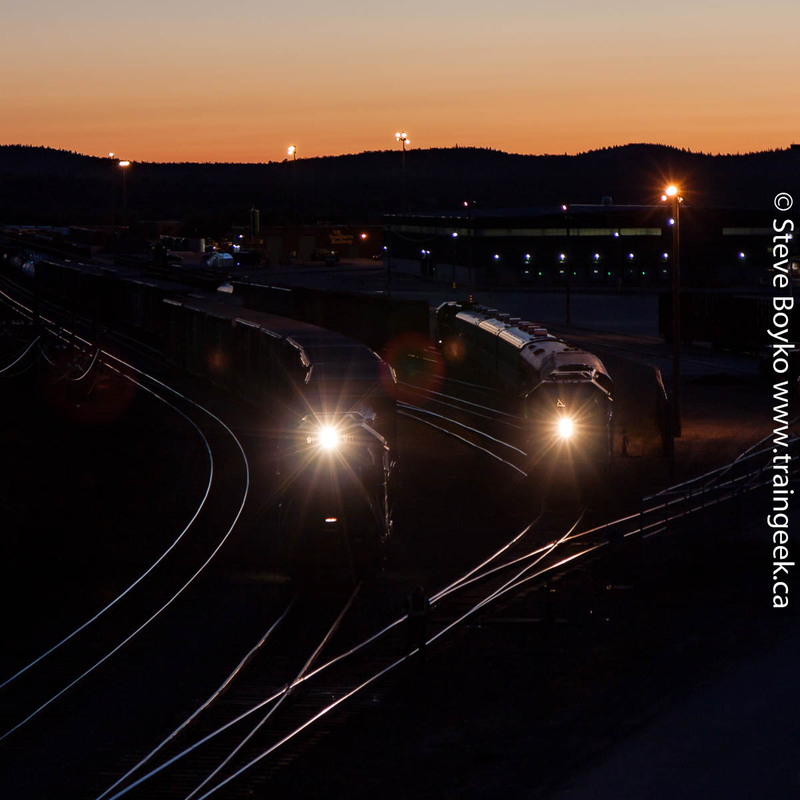 The train had NBSR 9801 with the three ex VIA Rail coaches (5448, 5471 and 5537) along with their "new" #508 and the Metis. NBSR 2317 was on the other end. The light was pretty low so I was shooting with a 1/20s shutter speed, meaning the blur was inevitable. They took off and I gave chase. I decided I would try to catch them crossing the Reversing Falls bridge. I got to the Falls well before them, so I parked and ran up the hill to get a broad view of the bridge. This was at 7:15 PM so the sun was already down below the horizon. Tricky light! I decided to stick to my original plan and headed to the Dever Road yard. I didn't think I would beat them there, and I was right. They were rolling under the Green Head Road overpass when I arrived. 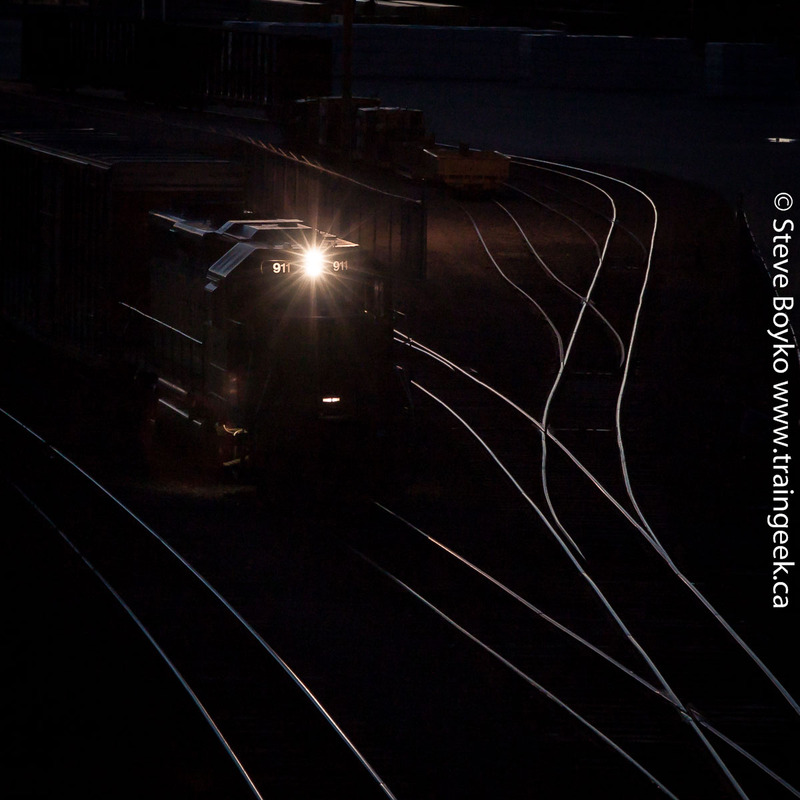 I did managed to catch them passing the night switcher, NBSR 911. I like how this turned out. That was it for me for the night. 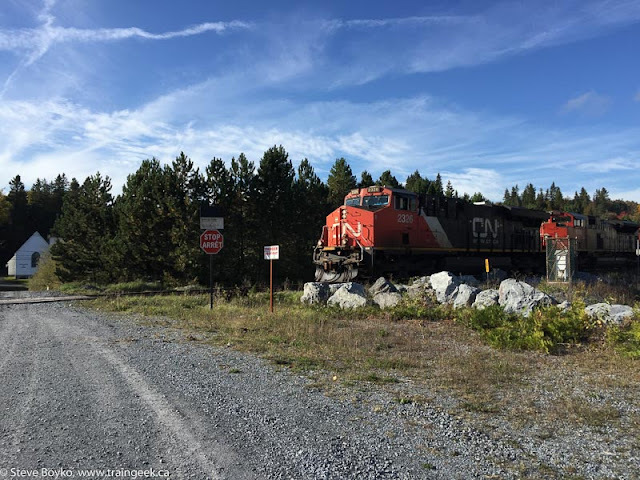 In part 2 I shared my catch of CN 406, twice. 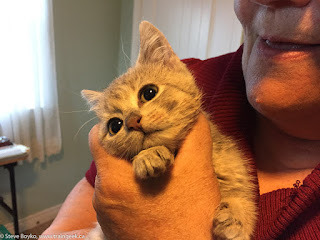 Until then, you might wish to read about my visit to New Brunswick in 2011.. 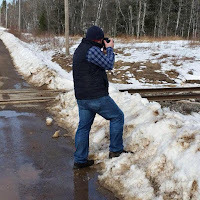 I put 10 questions to Matt Landry, who is a railfan in New Brunswick, Canada. I've known Matt virtually for years and we've met in person a couple of times. Well, let's see, I'm Matt Landry. I was born and raised on PEI. I lived in Ottawa for five years (8-13 years old) before moving back to PEI, where I lived until 2007. From there, I moved to the Saint John, New Brunswick area, where I still live 9 years later. I work for Baxter Dairies (milk company). I've been there since 2009, where my job consists of sales and merchandising. Honestly, I don't really know why. My great grandfather was a flagman for CN on PEI back in the day, so my mom says it's kind of in my blood, even though I don't work for the railway. I guess people need to have an interest in something, and for myself, it would be the trains. 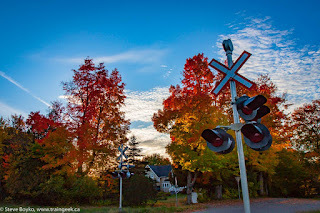 I used to just pull over and watch the trains if I was stopped at a crossing or knew if one was coming. After a while, I realized, "hey, people are taking video and pictures of them", so that's where my love for the video/photo side of it started. 3. Where’s your favorite place to railfan? Honestly, I don't have a favorite spot to railfan. I've been getting more involved with photography over the last few years, so I'm constantly trying to find new areas to take photos. I guess I could say that the Moncton area would be my favorite spot, but the photo locations around Moncton always change. I've always wanted to catch the CP Holiday train. Obviously closer to Christmas would be better, but I would also be happy to catch them shortly after they depart Montreal, i.e. 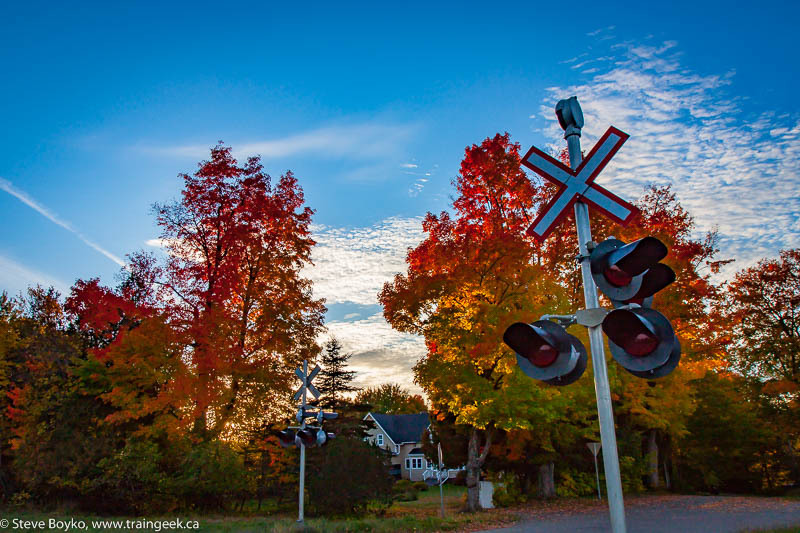 Smiths Falls. 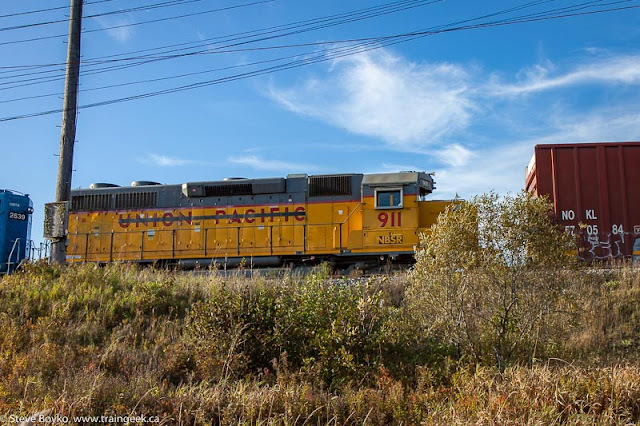 Another area where I'd love to railfan would be out in western Canada, more specifically, along the Rockies. There's so many great photos that come out of those areas, and I'd also want to hike around and try to find vantage points which haven't been found yet. 5. What’s your favorite railway? Unfortunately, CN, NBSR and CBNS are the only railways in my area. 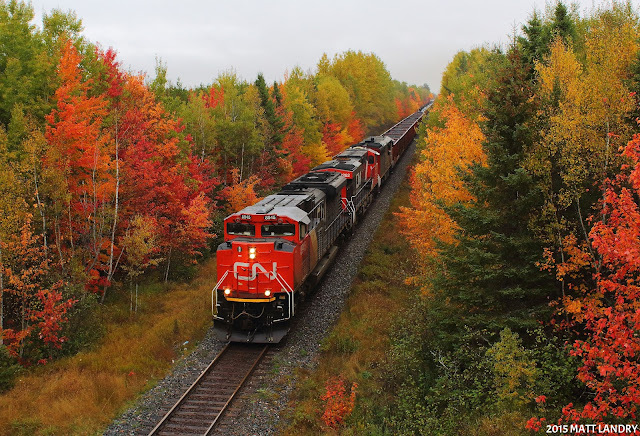 As much as I see CN on a more regular basis, my favorite railway would be the NBSR. 6. What’s your workflow for processing and sharing your photos? I always take multiple shots of one scene when I'm out. 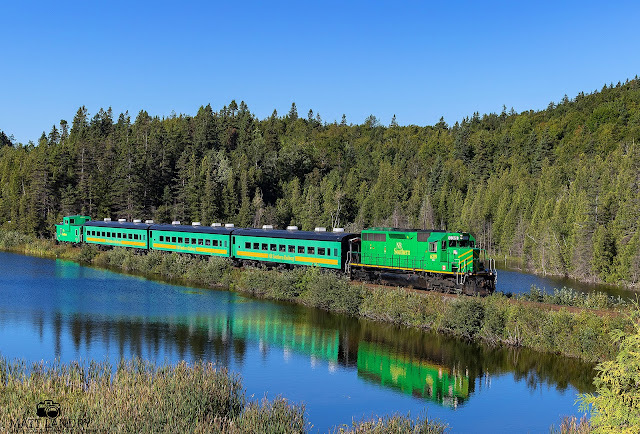 For example, a short time ago, I chased the NBSR from Saint John to McAdam. In that 3 hour chase, I took about 30 photos, but I only choose about 5-6 to actually work with. I shoot raw, so I pull the shots off the camera into Photoshop's "Camera Raw" application, which works amazingly well. After editing, I bring my photos over to Lightroom, where I apply the watermark to my photos. Once this is finished, if time permits right away, I'll upload them to Flickr and submit them to Railpictures.net. 7. How do you decide where to take your photos? It just depends. I try to find spots where the lighting and scene is great, and I try to find a location that I haven't shot anything at for a while. Sometimes I'll go back to a scene that I might have recently shot at, but I'll go to a different vantage point to try for something different. 8. Do you use presets with Lightroom or edit each photo individually? I edit each photo individually. I'm always using different settings and different lenses, so I just find it's better to work on each photo individually, even if it does add a little bit of time. 9. 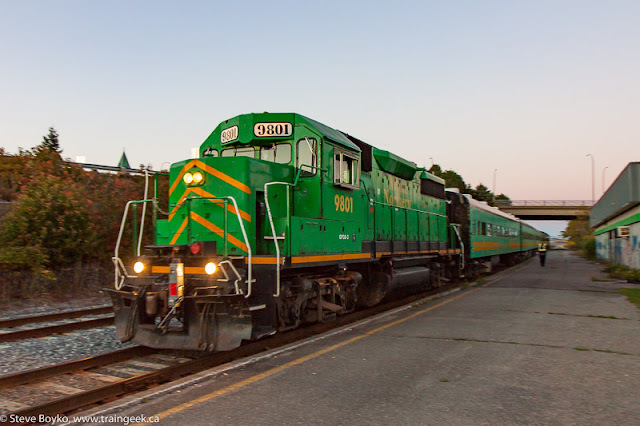 What recommendations would you give to the intermediate railfan to improve their photos? Try and get out of Auto. Shooting in manual actually isn't that hard, and it gives you WAY more control over your photos. 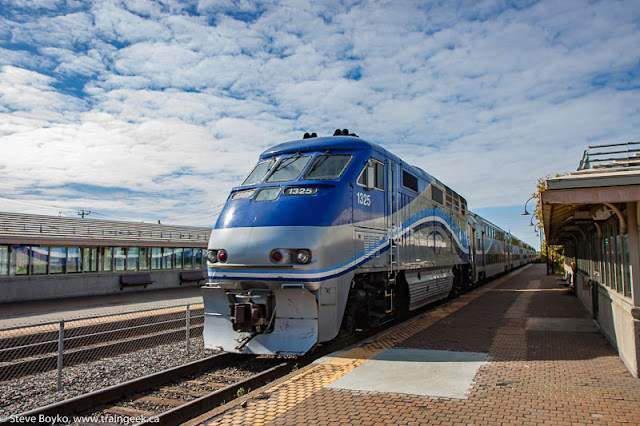 For a fast moving train, you want a faster shutter speed, and having the camera decide the settings can be fatal, especially if you've been waiting all day for your first shot or whatnot. Even if you want to start with "Tv Mode", aka "shutter priority", that's something that you at least have control of. The last thing you want is a blurry train when you don't want it that way. Oh, try and have fun. This hobby can be frustrating sometimes. 10. What projects do you have ongoing or planned? Not sure if you'd call this a project, but over the next little while, I'd like to start getting back into shooting video on a regular basis again. At one time, video was my main priority, but it's taken a back seat to photography. I've only uploaded about 4 videos so far in 2016, so I'm hoping to get back into the video side of it again soon. Thanks, Matt! 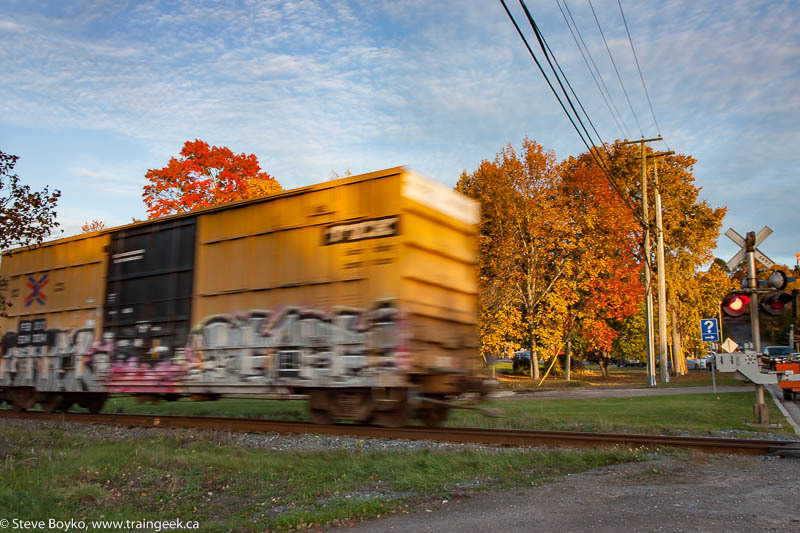 To see more of Matt's work, check out his Railpictures.net profile, his Flickr photos, his YouTube videos, or follow him on Facebook. I was down at the Forks in downtown Winnipeg on Saturday with my family. We were playing a little Pokémon Go and trying out the Pancake House restaurant for lunch. After lunch, we decided to walk along the Assiniboine River around to the actual fork where it meets the Red River and then loop around to our parking spot. 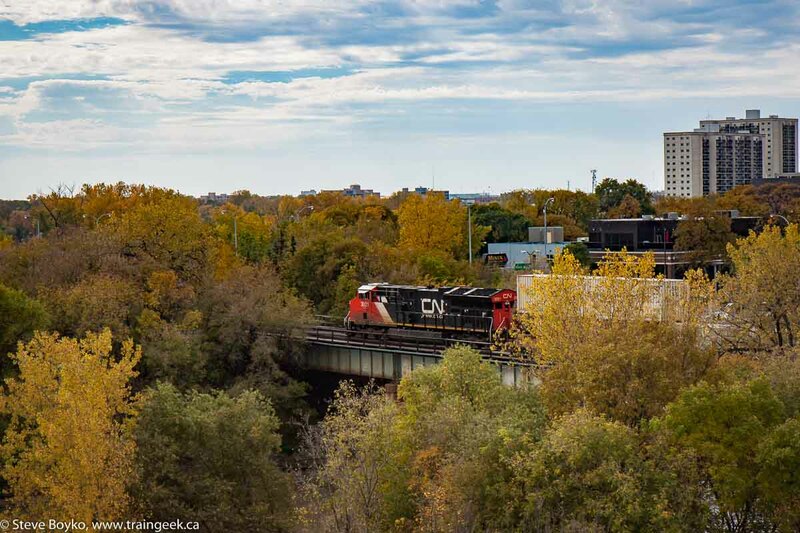 I wanted to try shooting a train from the tower at the Forks so I let them start their route while I raced up the stairs to the top of the tower. I was hoping that VIA 1 was still at the station but they had left more or less on time. 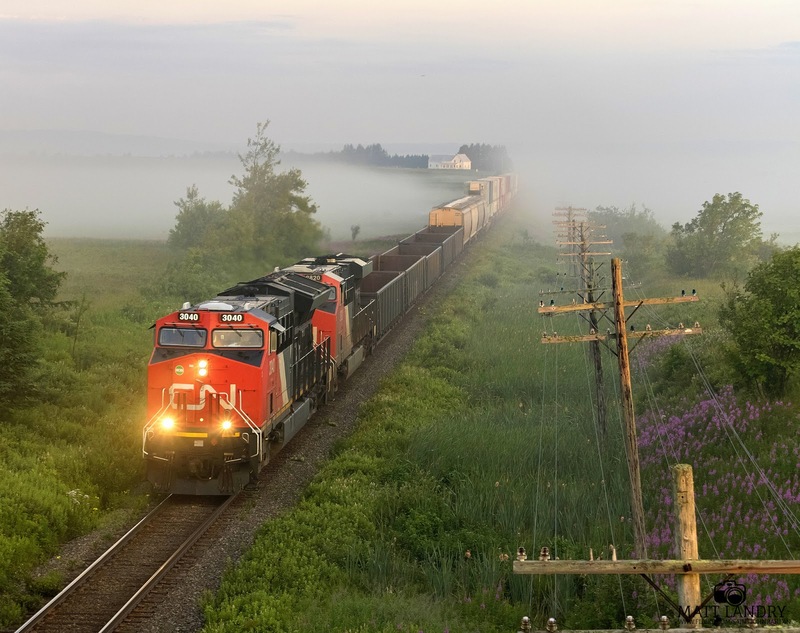 However, CN was very kind and sent a container train along right on time. I scooted past a group of tourists and started shooting as the train passed Union Station and the maintenance crew on the north track. The tower is good for getting a view of the downtown but the large roof area in the foreground is a bit distracting. The "going away" photo was into the sun, so some significant image editing was required to get a passable photo. 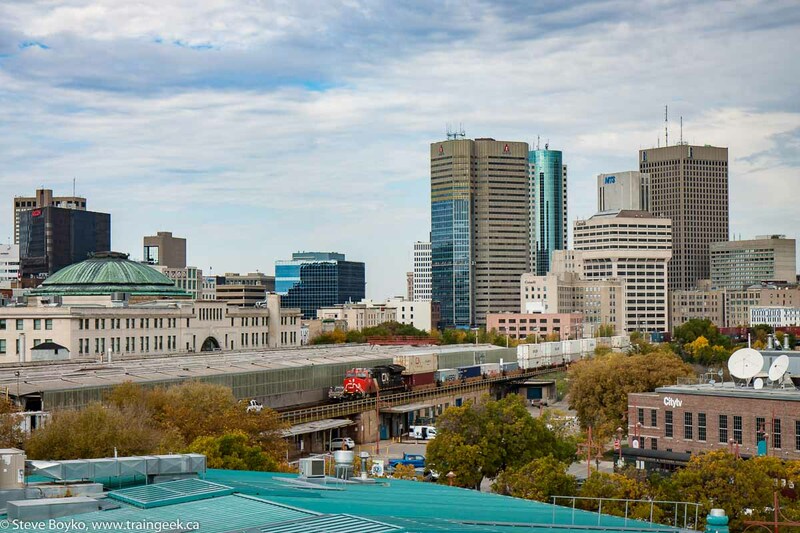 A morning shot of an eastbound train would be nice from the tower. 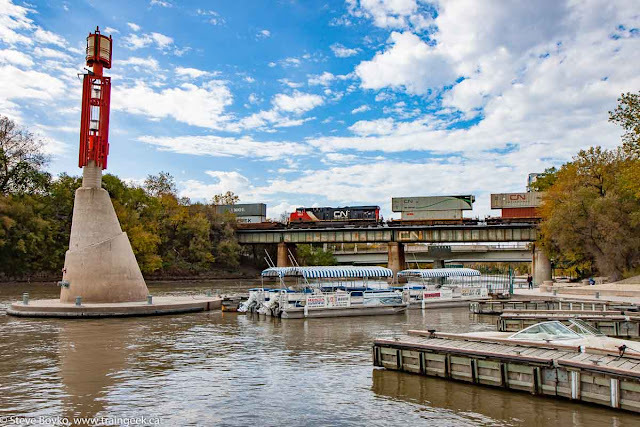 After the head end passed by, I trotted down the stairs and out to the Assiniboine River to get the DPU unit(s). How did I know there was a DPU? Well... one locomotive normally isn't enough to pull an entire container train by itself. I waited at river level until I heard the roaring DPU locomotive, which turned out to be CN 2928. There are lots of tour boats around, and the river has been low enough for the docks to be in place. At times this area is flooded and the river walk is submerged. I wasn't sure if there was going to be another unit on the rear, but I decided to change positions and find out. I went up on the Low Line bascule bridge that used to go to CN's East Yard, which is now the Forks tourist area. 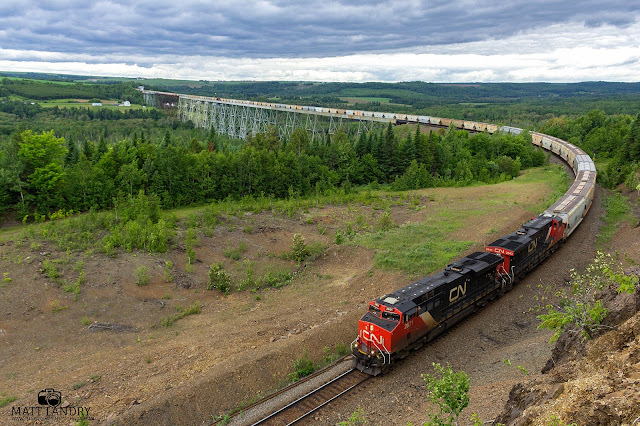 Incidentally, there is a detailed document on this bridge (PDF), built in 1914 for the Canadian Northern Railway. 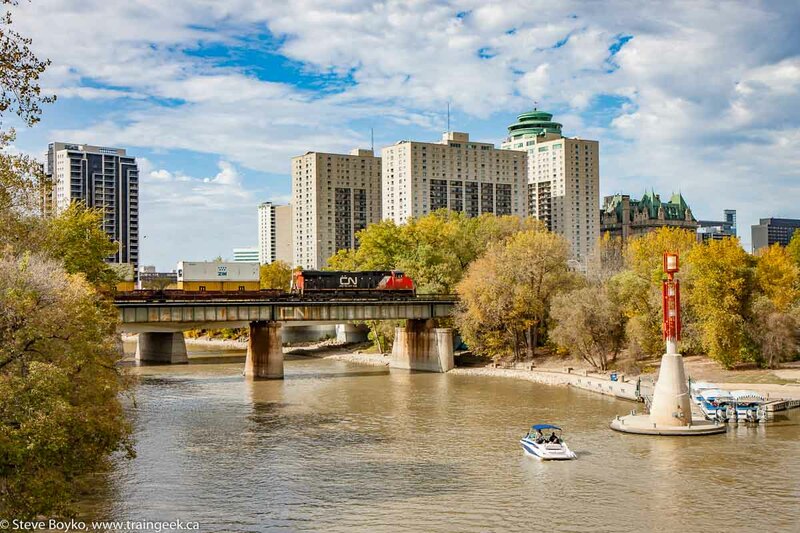 The sun came out to play and lit up the buildings near the Fort Garry hotel nicely, as tail unit CN 2907 rolled over the river. That was the end of the train and the end of my train watching for the day.